MECHANICAL FINDER includes all the functions required for CT based finite element analysis. This means that you can perform seamlessly all procedures, that is, DICOM import, segmentation, implant installation, mesh generation, material setting, boundary condition setting, analysis and result evaluation. 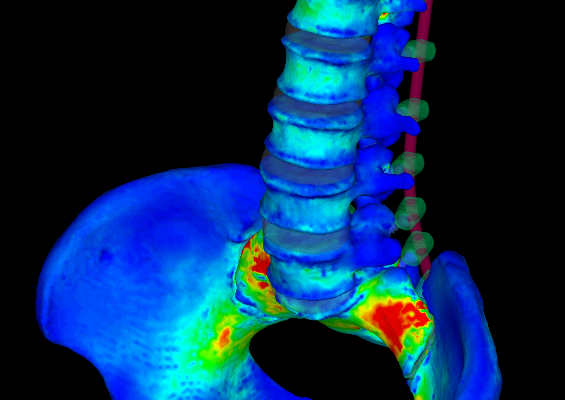 Since 3D model can be constructed from DICOM data, it is possible to reflect the patient-specific bone geometry to the model. 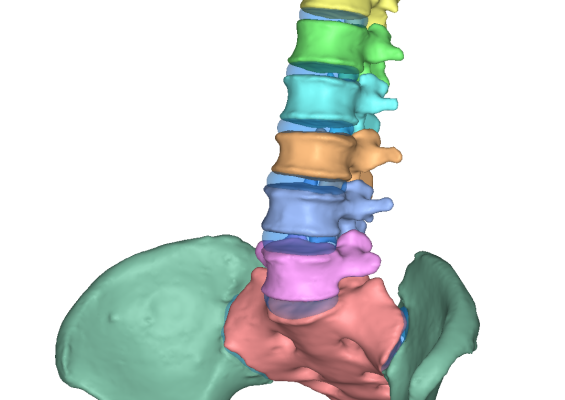 You can create 3D model by extracting region of interest (ROI) such as bone from CT data by image processing or manual correction. 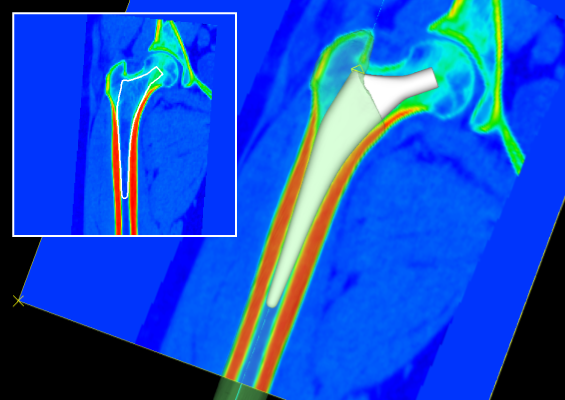 Because it is a computer model, you can easily create osteotomy models and bone defect models. 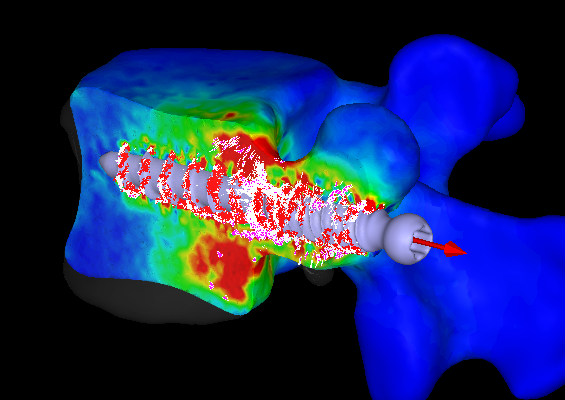 You can import geometries such as implants in STL format as well as geometries constructed from CT data. 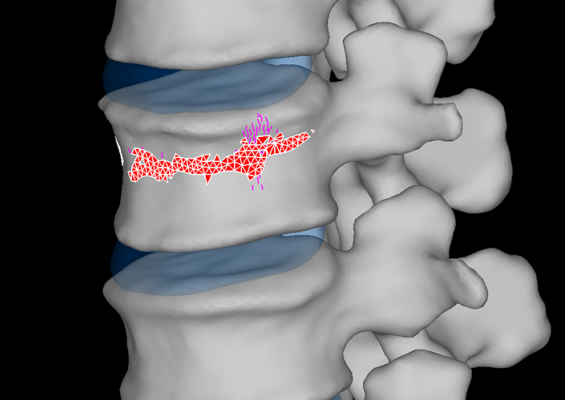 The position of the implant can be adjusted while displaying surrounding CT images. 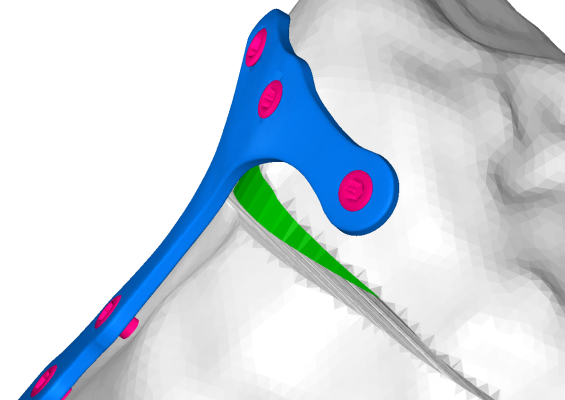 In addition, you can set the axis and rotation center of the STL data, and by using it, it is possible to replace the installed screw by one with different length. Just specifying the mesh size, you can automatically generate a tetrahedral mesh with the size according to the curvature of the geometries. 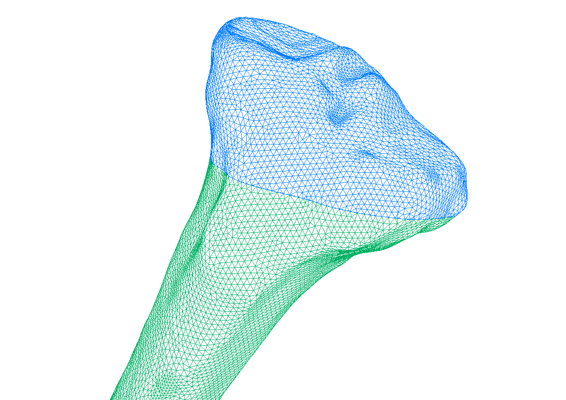 Even if various geometries overlap complicatedly, such as bones, soft tissues, implants, boundaries between them are extracted accurately and tetrahedral meshes are generated. In addition to tetrahedral elements, you can set shell elements and truss elements. Truss elements can be defined by strain-tension relationship, and it is useful for modeling ligaments where force works only in the tensile direction. 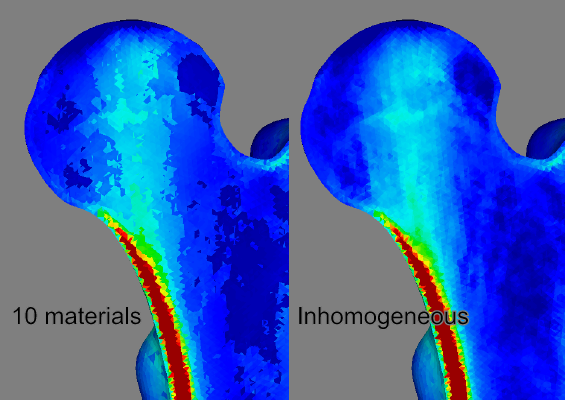 Finite element analysis of bone has been performed with homogeneous material, or a two-layered model consisting of cortical bone and cancellous bone. However, inhomogeneity of material properties is important to evaluate bone stress and fracture. 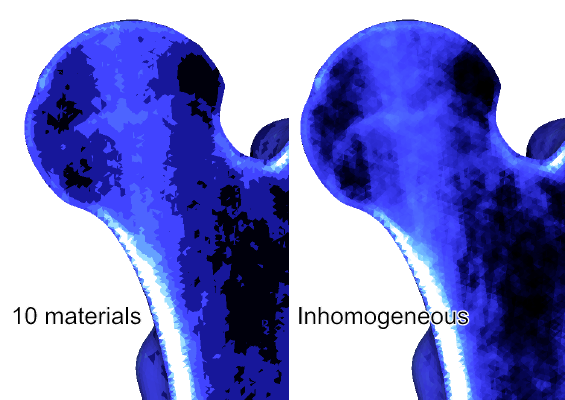 Analysis considering bone inhomogeneity is increasing now. The CT value is converted to density, then each material property such as Young’s modulus is converted from density by referring to papers. Since general FEA solvers have the same material property ​​for one material, the number of material property ​​is practically limited even when material properties ​​are obtained from CT values due to their data structure and rendering problem. In MECHANICAL FINDER, since solvers and post processing have been developed assuming inhomogeneous materials, there is no limit on the number of material properties ​​of bone. Each material property can be assigned to all tetrahedral elements based on the CT value of their position. To set the load condition, you can set the direction based on the preset axis. 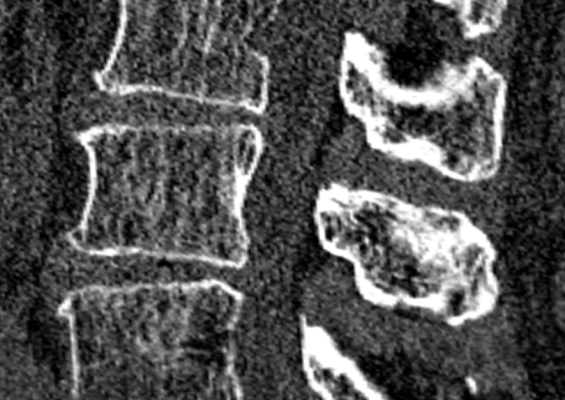 It is convenient to align conditions between analyses with different CT. In addition, when you set muscle force by load, you can also set the direction of it to always point from the origin to the insertion even if the bone positional relationship changes. Forced displacement also can be set. When expressing cadaver experiments such as compression test and screw pullout test in finite element analysis, it is used for setting boundary conditions. In addition to elastic analysis, you can also perform material nonlinear analysis which deal with the plasticity and fracture of elements. 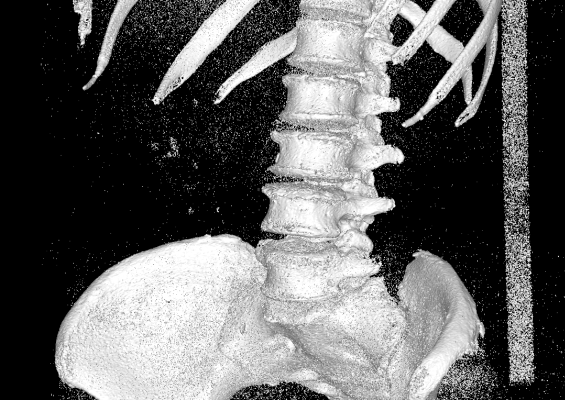 To evaluate clinical fractures it is necessary to define a fracture in finite element analysis, but it is often found as bone strength from the displacement-load curve. 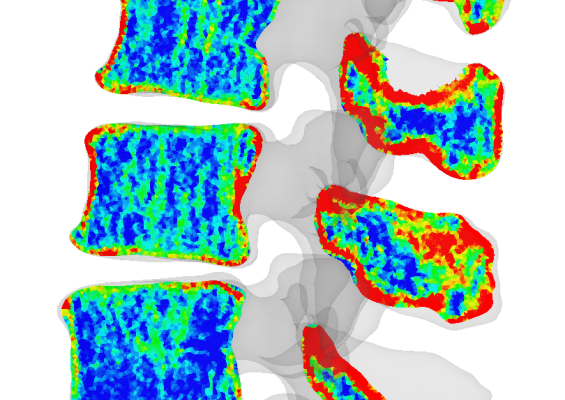 There are some papers about cadaveric experimental validation of finite element analysis. Not only analysis based on Small deformation theory but also geometric nonlinear analysis is available. Especially in analysis with large deformation and rotation, analysis can be performed accurately by geometrical nonlinear analysis. 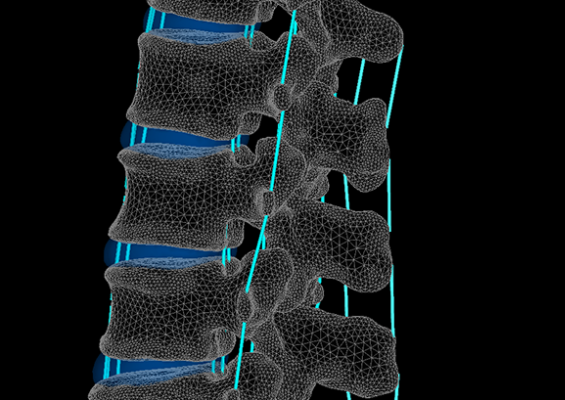 Also, soft tissue such as intervertebral disc can be modeled as superelastic element. In addition to static analysis, dynamic analysis which takes account in inertial force can be performed. By giving the initial velocity or setting the time-varying load, you can analyze phenomena occurring in a short time such as collision and impact. 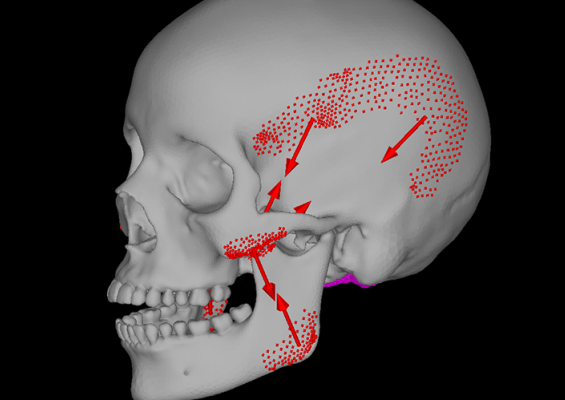 Contact condition can be set on the boundary of materials such as bone and implants. It can be also set between multiple materials, and the friction coefficient can be set on the contact surface. 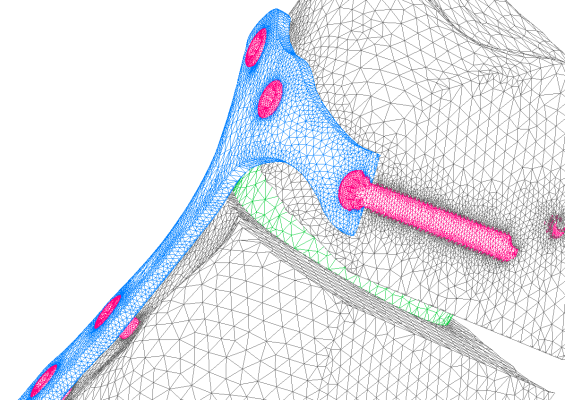 By using the contact condition, it is possible to create a more realistic model such as the boundary between a stem and a femur just after THA surgery. Various results such as contour map of stress distribution and fracture map can be displayed: Deformation map / Contour map / Vector map / Tensor map / Fracture map / CT display. In addition, since it is possible to extract elements or nodes in region of interest and output data of all the extracted elements or nodes in CSV format, you can use it as editing or taking statistics with Excel. You can save the visualization frame as an image at each step such as material property and result screen. It also has a function to save the viewpoint, which is convenient when comparing results of different implant models. You can also save multiple frames as a video file. The videos of this web page are created using this function. You can output the geometry generated from the ROI extraction data, the placed geometry after importing, and the surface mesh after generating the tetrahedral mesh in the STL format. 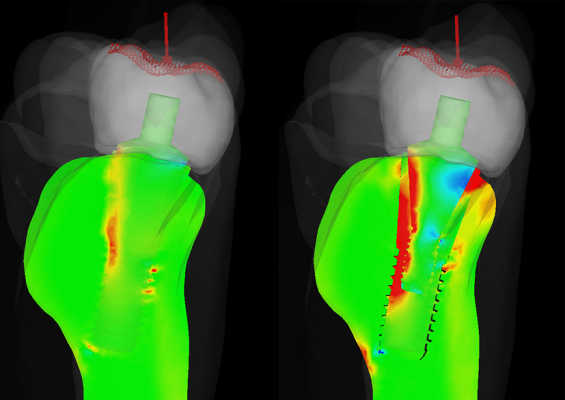 It can be used when reusing geometry extracted from CT in other models or when creating cut bone geometry once for osteotomy model. Copyright © 2018 - 2019 Research Center of Computational Mechanics, Inc.